The Judge is well-made hokum. It’s filled with nice, small moments and big, phony ones, all of them delivered by a cast of total pros. The movie will stir your emotions, but more often it may utterly exasperate you. Part courtroom thriller, part father-son drama, part prodigal-son-returns character piece, this Robert Downey Jr. vehicle is, ultimately, an unabashed movie-movie, feigning realism when really it resides in a land of earnest, feel-good make-believe. Even if you end up liking The Judge, you may hate yourself later for falling for it. The film represents a major change for director David Dobkin, who previously helmed R-rated comedies like Wedding Crashers and The Change-Up. For his latest, he’s made a movie that seems like it could have been adapted from a Scott Turow book, or one of those airport novels with tons of colorful characters, juicy moments and maybe a jerked tear or two. Downey plays Hank, an almost comically stereotypical big-city Chicago lawyer who makes millions defending slime balls. Cocky and shameless, Hank is flying high when he receives word that his mother has died, prompting him to travel back to his small-town Indiana roots for the funeral. There, he reunites with his two brothers (Vincent D’Onofrio and Jeremy Stong) and his cantankerous father, Joseph, who has been a beloved judge in the community for over 40 years. Unpretentious and decent where Hank is arrogant and disdainful of his Indiana childhood, Joseph is not happy to see his estranged son. Likewise, Hank wants to head back to Chicago as soon as possible, but his return trip is unexpectedly delayed when the judge is charged with vehicular manslaughter. Even more surprising, the victim is a man Joseph sent to prison for 20 years who has just gotten out. Joseph never liked the man, so was it an accident or premeditated? And is Joseph being truthful when he says he doesn’t remember the accident? These are the questions that plague Hank, who steps up to defend his father in court, despite the bad blood between them. Not unlike other Warner Bros. releases that played Toronto before opening in the fall—The Town, Argo, Prisoners—The Judge is a decidedly grownup entertainment, favoring sturdy performances and somber themes for easy wham-bang thrills. As a result, The Judge feels hearty and a bit slick—a big, old-fashioned studio movie that projects an air of seriousness. Downey, starring in his first drama since 2009’s The Soloist, lends Hank an enjoyably slippery charm, but the problem with the character is that his initial obnoxiousness is so overdone that it’s inevitable that he will have a change of heart by the movie’s end. (Big-city types tend to do this a lot in movies when they return to their Midwestern childhoods and reconnect with their families and/or old flames.) Still, Downey manages to sell the sometimes programmatic nature of Hank’s personal transformation. In this regard, Downey is supported beautifully by Duvall, who plays Joseph as a stubborn, dying man unwilling to let go of their past feuds. (The depth of their animosity will, naturally, be explained over the course of the film, which will lead to a poignant resolution.) Joseph could be a predictably crusty-old-codger cliché, but Duvall won’t let that happen, and so what emerges instead is a fairly nuanced look at aging. (It’s clear the judge has the early stages of Alzheimer’s, and he’s battling stage-4 colon cancer.) Despite The Judge’s tendency to batter you with emotional crescendos and manipulative plot twists, the filmmakers show real sensitivity in the scenes between Hank and his father as Joseph’s body begins to physically break down. This, happily, is one of the few studio movies that’s unafraid to discuss the unpleasant truth of advanced age. But such moments of gracefulness are often offset by showy characters and over-amped courtroom intrigue. 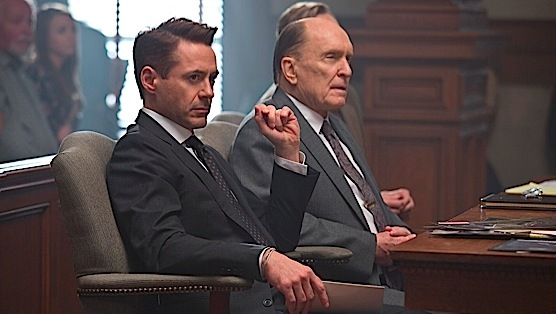 (If you’ve been dying for a film in which there are several audible gasps in court whenever “shocking” information is revealed, The Judge will be your must-see event of the season.) This is the sort of hopelessly preposterous movie in which two characters finally have it out while a tornado is raging all around them—and yet, The Judge is consistently anchored by turns from the likes of Farmiga, D’Onofrio and also Billy Bob Thornton, who plays the prosecuting attorney who wants to nail Joseph for his own unexpected reasons. The film’s deep-dish drama makes room for everything—redemption, forgiveness, legal ethics, paternity mysteries—and it can often look beautiful doing it. (Cinematographer Janusz Kaminski makes the courtroom scenes glow with dramatic gravitas.) But ultimately, for a movie about the messy emotions inherent within fractious families, The Judge feels a little too tidy, polishing off the rough edges with warm smiles and Bon Iver songs. You may get weepy on occasion, but you can also sense the gears turning and the strings being pulled.